You’ve been sitting all day in your cubicle, typing madly away at a TPS Report with an imminent deadline. Your boss pings you to come over to her desk. You stand up, and Ow! Your low back aches in protest, hamstrings screaming, shoulders groaning. 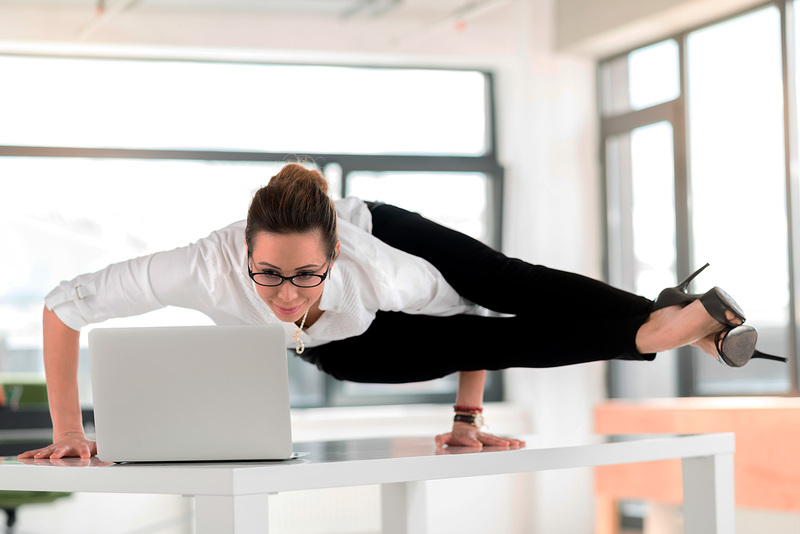 The good news is that you don’t have to feel this way: indulging in 15 minutes of office yoga will energize and release tightness, leaving you ready to dive back into your workday. This 15-Minute Office Yoga Practice is based on the best practices I’ve used as an office-bound entrepreneur who follows the path of yoga. Use it to relax, drop the stress, and give your body a much-needed break. Back pain is often eased by integrating activity into the workday. This is a simple way to wake up sleeping muscles, to loosen tight ones, and to encourage nourishment of the entire body. Get up & walk around – Visit the breakroom, a friend, or grab a coffee down the street. Getting blood back into your hamstrings, hips, and legs will help release a sore back. Sit at an ergonomic setup – Ergonomic desk setups can improve posture and reduce back pain over time. Common tricks include putting computer monitors at eye level and placing the keyboard exactly where the elbows are at a 90-degree angle to the body. Your office may have a program to encourage sitting ergonomically. Try a standing desk – Alternating between standing and sitting strengthens the muscles in the lower body, which support the back’s normal functioning. 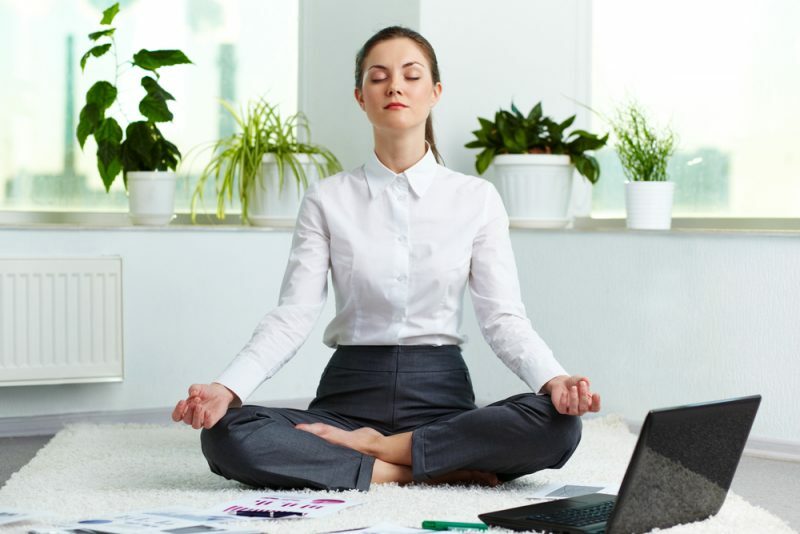 Plus, changing position can help clear your head, ultimately making you more productive. Before you begin moving, we’ll do a two-minute meditation to ground ourselves in the present moment. Sit at the front edge of your chair. Plant both feet flat on the floor hip-width apart with the hands resting comfortably on the lap. Release your sitting bones towards the floor. Pull the crown of the head towards the ceiling. Close the eyes and check in with your breath. Where is it in your body? Is it fast, slow, even, or choppy? Any pattern of breathing is perfect. Open your eyes when you’re ready to begin moving. Do these poses sitting as you were in the meditation: at the front of your chair, both feet planted on the floor, allowing sitting bones to release into the chair while the crown of the head rises towards the ceiling. The vertical stretching action in the spine will help to release your tight back muscles. Perform each pose or movement for about one minute or thirty seconds per side. Make sure to do both the right & left sides for asymmetrical exercises. 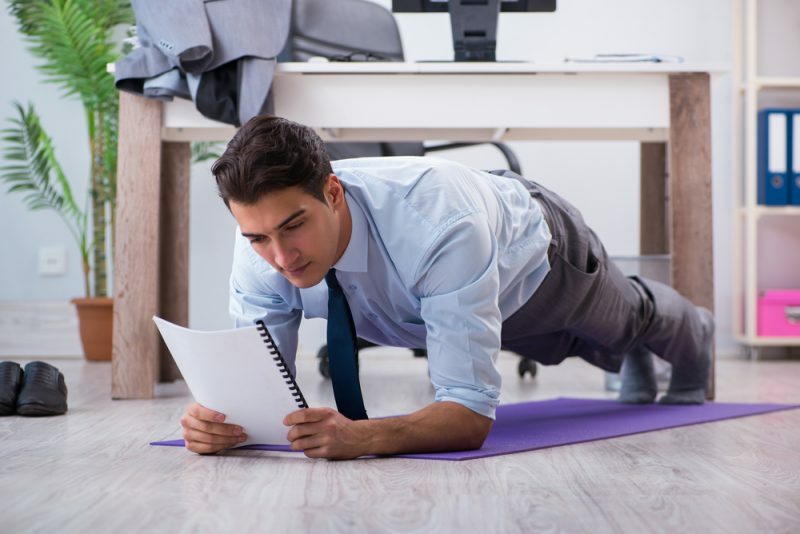 The exercises go from the top of the head down to the feet, so you’ll feel extra relaxed in every part of the body and ready to get back to work afterwards. This stretch will release the sides of the neck and the trapezius muscles at the top of the shoulder. Stretch the right arm straight up towards the ceiling. Keep the arm vertical as you exhale and release both shoulders down. Stretch the left arm down, middle finger pointing towards the floor. Bring the right palm over your head so that it cups your left ear. Gently pull your right hand towards your right shoulder so that your head moves towards the right. You may feel a stretch in the left side of your neck, left shoulder, and/or left arm. Breathe in that position for 10 – 15 breaths until you feel your body relax. You can experiment with changing the angle of the top hand so that the chin gently tilts towards the floor. This moves the stretch to the back of the neck. This exercise stretches both the pectoralis (chest) muscles and the muscles of the shoulder girdle and upper back, a powerful antidote to hunched shoulders from typing on a computer. Sit in an upright seated position with both feet on the floor. Relax both arms down at your sides. Roll your shoulders forward so that they come apart on the back, rounding your back strongly forward. Then, roll them backwards so that they come together. Your arms may be bent or straight. Inhale as they come forwards and exhale as they go backwards. After ten rolls, reverse the direction. Send them backwards on the inhale and forwards on the inhale. Roll them in this direction ten times. This pose is an extension of the shoulder rolls to bring a stretch into the entire back and front of the abdomen. Strongly squeeze your shoulders forwards and together, allowing your entire back to round like a scared cat. Feel your breath go into the back of your body as your front is compressed. Hold here for three breaths. This might be a big stretch for the upper back! Reverse, bringing your shoulders backwards with an open chest, bringing the clavicle up towards the ceiling. You’ll feel a stretch through the entire front of the abdomen, including chest and belly. Breathe in this position for three breaths. Alternate front & back stretching, holding each. Now, you’ll start to move the spine in rotational movements to release tension in the spinal muscles and abdominal muscles. Creating space in the front and back of the abdomen is key for softening back pain. Bring your hands out straight at your shoulders, then fold at the elbows so that your fingertips touch the tops of the shoulders shoulder. Begin to twist by bringing your right elbow to face backwards, then slowly turning in the other direction so that your left elbow faces backwards. Link up with your breath to inhale as you move right and exhale as you move left. Rotate ten times. Now, release your arms and place the hands on the knees. Roll in a circle, bringing your shoulders towards your knees, then back and around. Inhale forward and exhale back. After ten rotations, rotate in the other direction. Now that your spine and shoulders have started to open, you’ll actively stretch the chest muscles to reverse computer slouch. Sit at the back of the chair with both feet planted on the floor. Bring your shoulder blades (the triangular bone at the back of your shoulder) to graze the chair back. Bring the right arm behind the chair back and grab the arm or seat of the chair from behind, whichever is available to you. Bring the left arm back. Push down with the hands to stretch the chest up towards the ceiling. Relax the belly. Standing exercises will wake up sleeping leg & hip muscles whose support is critical to releasing a painful back. You’ll find that you have a clearer head after standing up, too. I find that it’s best to take your shoes off to do these stretches. The connection of the feet to the floor helps our body balance itself; plus, tight foot muscles can cause back pain by limiting mobility in the legs & hips. Try it out! This is a variation on uttanasana, or the standing forward fold pose. 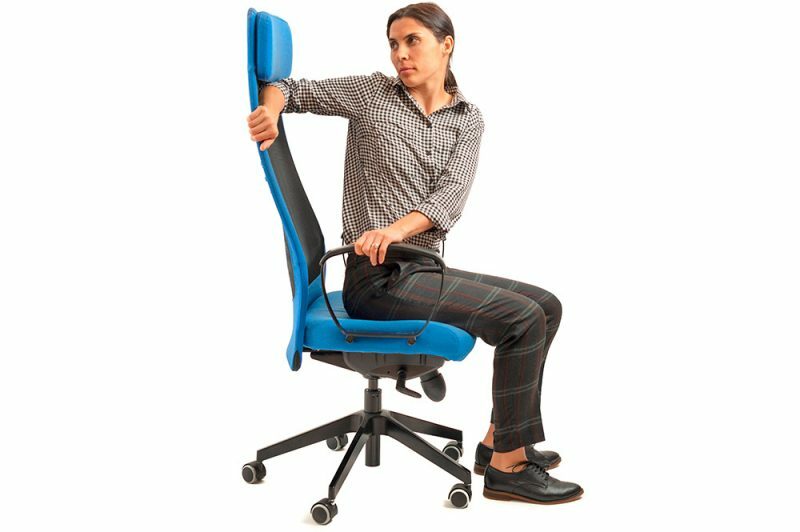 This modified version using the chair is beneficial for those with back stiffness, especially if you’re wearing office clothes. 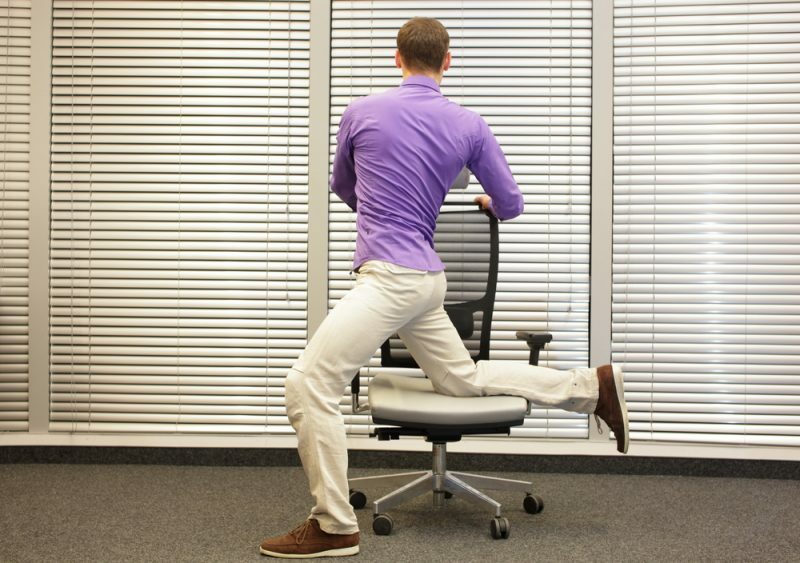 Stand in front of your chair with the back facing you, feet hip width apart. Lean forward and place the palms shoulder-width apart on top edge of the chair back. Walk the feet backwards so that your arms are fully straight. Lean forward, bringing your head towards the ground, and walk backwards until you feel a stretch in the back, hips, or legs. Push down through your hands and feet. Each person is different in how far away from the chair they will go to feel a stretch. Your back might be almost straight, or it might be parallel to the ground. Stand with the back of the chair facing you. Place both palms shoulder-width apart on the top edge of the chair back. Start with the feet hip width apart. Now, step the right foot back, bringing the weight onto the toe-side of the back foot. Press the heel backwards in space to stretch the calf. Hold for five breaths, then switch sides. Time to wake up sleepy lower-body muscles with a modified squat. Strengthening the hips, glutes, and hamstrings can reduce back pain by supporting the back in daily activities like sitting and walking. Stand with the back of the chair facing you. Hold the top of the chair back with both hands for support. Place the feet shoulder-width apart, toes pointing forwards. Exhale and relax the belly. Tuck the tailbone downwards towards the floor. Squeeze the glutes to lower them towards the floor, keeping the tailbone tucked down. Hold at the bottom for 5 breaths. Push through the feet to come up. Squat five times. This is the ultimate release for quads that are tight from sitting at the office all day. Keeping the legs straight & strong helps them to relax. Stand with feet shoulder-width apart with the chair seat facing towards you. Make sure the back of the chair is supported against a wall, desk, or table so that it doesn’t shift. Put your hands on the chair armrests. Now, place your right foot flat on the seat of the chair. Your right knee will bend and your left leg will be straight at a 30 – 45 degree angle from the chair. Press backwards through the bottom heel to activate the bottom leg. Activate your glutes and strongly bring your right hip down towards the floor. This will bring balance to both sides of the spine. Option to stay standing straight or lean forwards to intensify the stretch. Hold for 5 breaths. This seated spinal twist is a delicious finishing pose. Sit with the feet shoulder-width apart. Turn your chest to the right side, bringing the left hand to the right armrest and the right hand to the back of the chair. Use the arms to hold the posture. Take 5 breaths, then switch sides. This pose gently stretches the entire length of the back. It helps to soften a busy mind, too. Sit with feet shoulder-width apart, hands on the knees. Inhale and stretch the crown of the head towards the ceiling. Exhale and stretch your head forward and down towards your knees, bringing your hands to your shins or the floor. Allow your spine to round and relax the belly. Breathe here for up to 10 breaths. Take fifteen minutes out of your day to relax, rejuvenate, and restore with these simple yoga postures & stretches. Your body and your mind will be glad that you did.